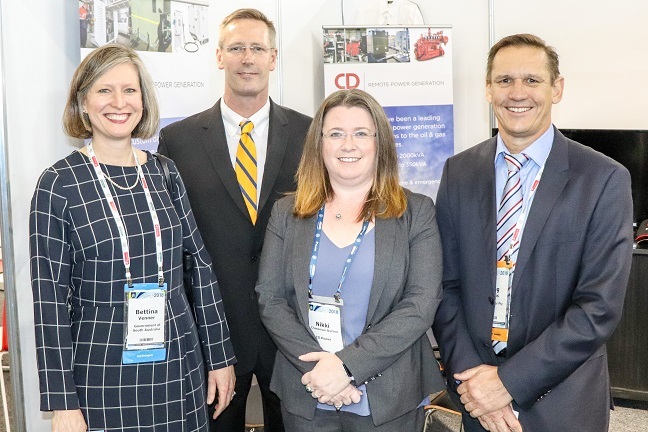 The CD Power team were out in force at last week’s APPEA 2018 Conference in Adelaide. The largest annual upstream oil and gas event in the southern hemisphere provided an opportunity for our staff to network and chat business with key clients including Senex and Beach. Greg Harris’ presentation during the Innovative Engineering session was well-received and generated a lot of interest in CD Power’s capabilities. Following his presentation, Greg received some interesting questions regarding synchronising gensets and canopy design to achieve optimal sound ratings. One of the highlights for CEO Nikki Cheesman-Dutton was meeting the South Australian Minister for Energy and Mining, The Honourable Dan van Holst Pellekaan for the first time. Nikki and Minister van Holst Pellekaan discussed CD Power’s presence in his electorate of Stuart in the State’s North East, with provision of remote power solutions to pastoralists. He was impressed to hear about the growth of our organisation, how we’ve tripled our numbers in the past 12 months, employed ex-automotive industry workers and CD Power’s stance on encouraging workplace diversity. We look forward to welcoming Minister van Holst Pellekaan on a site tour of CD Power in the very near future. Pictured (L to R): Bettina Venner, Manager Industry Participation from the Department of State Development (Industry Capability Network), Minister Dan van Holst Pellekaan, Nikki Cheesman-Dutton and Greg Harris.